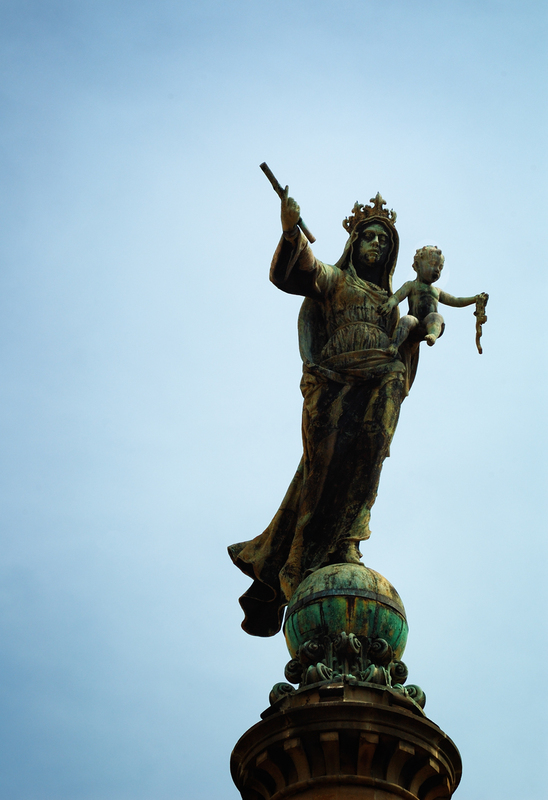 What better to commemorate the festivities of Our Lady of Mercy or Mare de Déu de la Mercè or Virgen de la Merced than showing the Virgin itself. This is the way she appears on top of the church that goes by the same name. As you know every September 24th Barcelona honors La Merce with numerous activities all over the city. I just wanted to say that La Mercè is of course one of the many ways to refer to the Virgin Mary. According to religious scriptures she appeared to Pedro Nolasco in the form of Our Lady of Mercy and commanded him to found the Mercedarian Order. She carried two bags of coins to pay the ransom of Christians caught by the Moors. That's why she is also known as the Lady of Ransom. The order was officially constituted by King James of Aragon in Barcelona on August 10, 1218 and approved by Pope Gregory IX on 17 January 1325. Although the Virgin manifested on August 1st, the date was later changed (1696) to September 24th. Find an image of Mare de Deu de la Merce in another post. We were in Barcelona last week, and we hired a Go-Car, any pictures of those funky little vehicles yet?